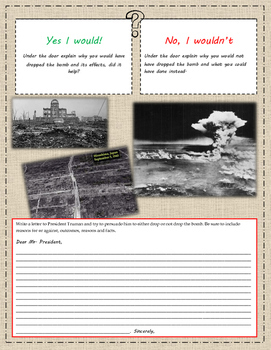 A brief reading and questions on the dropping of the bomb on Japan. 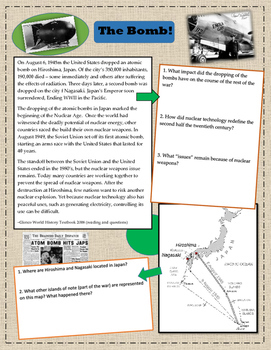 Page one contains the reading (three paragraphs) and a map of Japan as well as a few questions on both. 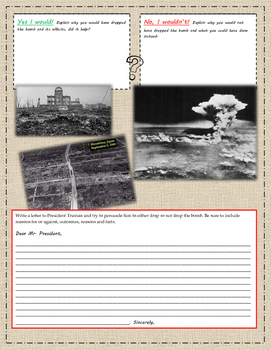 Page two and three are for students to write about both sides of dropping the bomb and then making a decision and writing a letter to the President to persuade him one way or another. Page two is a regular worksheet, page three is for use in an interactive notebook (doors to cut and write underneath).